Whether it’s because of expansion, pivoting your business’s goals and products, or dealing with a crisis, rebranding becomes an option when your brand no long matches what your company is all about. In order to shift your logo, name, mission statements, and so on, to reflect your current values and purpose, first you need to look at some of the pros and cons of rebranding. The most important pro of B2B SaaS rebranding is showing your customers that you’ve evolved and changed from your original idea. 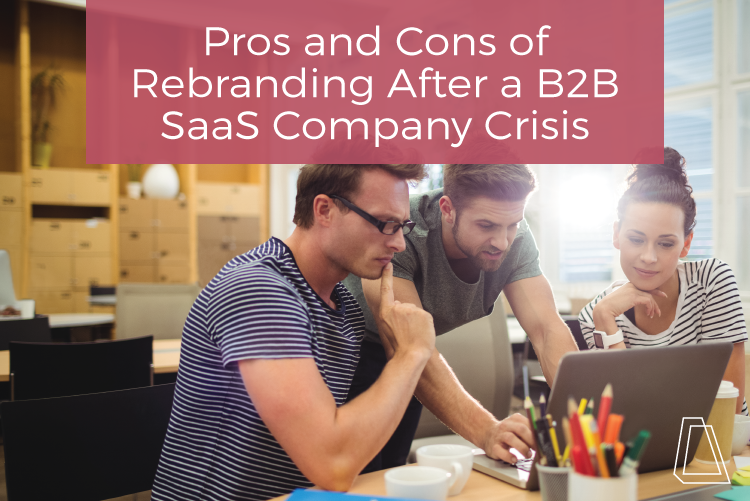 When handling a company crisis in particular, the way you handle rebranding is essential. You don’t want to seem like you are running away from the problems of your previous endeavors, so you need to show that the company has learned and grown as a result of the challenges you’ve faced. There is such a thing as rebranding too much. You don’t want to stray away from what your values are as a company so much so that you lose what your company was all about in the first place. Rebranding is not equatable to starting a completely different business, it’s changing the way you portray your business to your clients. Before you do anything else in design, or even brainstorming, sit down with your employees and top management teams to establish what is most important to you as a company. Carrying those values into your new brand allows your clients to see a certain level of consistency and grounding, while you transform. Whether your current brand has a tarnished image, or you’ve noticed that you’re ignoring expansion opportunities by having a very narrow and concentrated brand image, rebranding gives you the chance to open new doors for yourself and create a plan for an unknown future. It’s like buying up extra land around your current location—you don’t yet know what you will build there, but you know you’ll need that extra space now so it doesn’t become a problem in the future. One of the main reasons you may considering rebranding in the first place is in response to your customers. But a major consideration you should address is your customers’ reaction to rebranding. Without a good communication plan in place, the process of rebranding can become quickly convoluted. You need to be very clear about the reasoning behind the rebranding, what it’s going to affect (especially if you are considering taking on a different clientele with the new brand), and how your product offerings might change as a result. If you aren’t transparent about your changes, you may lose clients purely due to misunderstanding. With a new brand, you can attract buyers who didn’t previously connect with your company and didn’t know that you could fulfill their needs. Before rebranding after a crisis, always run a cost benefit analysis to determine if it’s worth it for your company. Usually there are many other factors that would influence that decision besides fiscal costs, but it depends on your company’s priorities and how “bad” the company crisis was. Once you decide to rebrand, you need to decide who is “need-to-know” about the change, and when to bring this message to the company at large. Announcing that you’re looking for ideas too soon in the process can result in an overwhelming amount of ideas flooding in, as well as a loss in productivity. Established their core values (as mentioned above). Took a step back to figure out what their new name really meant to them and their customers. Took care with design elements. They noticed that announcing big and undefined ideas had previously made it hard to focus on completing specific tasks, so they only brought in key players to rebrand. Rebranding can be a tricky business, but focusing on clear communication of ideas and laying out a plan before diving right in to doodle up a new logo can be a lifesaver. While you weigh the pros and cons of rebranding your company, please let us know in the comments about your rebranding stories, or any questions you may have!